For a designer whose big ideas have helped write the narrative for a string of name hotels across South East Asia, Nic Graham manages to deftly fly under the radar. Softly spoken and thoughtful, his work is exuberant, full of theatrics and sassiness, and firmly grounded in solid research and a laconic humour dripping in knowledge and experience. more space caught up with Nic to discuss ideas and design process, and why the big hotels are getting braver. MS: Nic, where did your design journey start and what was your first big break? NG: I studied Interior Design at RMIT in Melbourne before taking on a role with DCMI (now Carr Design) and moving to Sydney to head up their office 25 years ago. I opened my own studio 5 years later. I designed apartments and did renovations, a small boutique hotel in Hong Kong followed by the Cathay Pacific Lounge. In Hong Kong I began working with Bonnae Gokson who was at Chanel Asia and is one of my best girlfriends. I designed her apartment and from there just started getting all sorts of high-end residential work that led to a collaboration with Bonnae and the W Hotel in 2008. Winning the W Hotel in Hong Kong must have been a pretty big accolade for a small Sydney-based practice? Yes, a small practice of four getting to work on a project like that was amazing. It really was a breakthrough project in terms of where I am now and the hotels we do. That relationship with a larger brand was very important so I moved to Hong Kong for 6 months to make sure it was handed over smoothly before the Summer Olympic Games opened in Beijing. As a result, I developed a relationship with Starwood and then a year and half later, the founder of the QT Hotels and Resorts, David Seargeant, was setting up a new hotel brand and asked me if I would be interested in working with them. We clicked straight away. I completed the first QT Hotel on the Gold Coast 7 years ago, and from there we began developing the DNA for the QT brand. We have now completed 10 hotels for the group. How would you describe the QT brand? I think back in the early days, the word ‘boutique' was used very loosely to describe something small in scale and domestic in its sense of decoration. It was based on the New York hotel concept: small, cute with a strong emphasis on food and beverage. The idea of breaking down the formality of public spaces and looking at smaller room varieties with a more fabulous bathroom stuck. So in terms of aesthetic, for us it is definitely about weaving narrative into the story so that everything has a vintage wink to it. We look back at the history of the place to give us some visual cues on how to enhance the decoration and we started to use a lot of large-scale graphics and bespoke products in all of the rooms. QT Sydney was a pivotal point because there we designed our first furniture collection which added greater value to what we were doing and allowed me to explore more creatively. 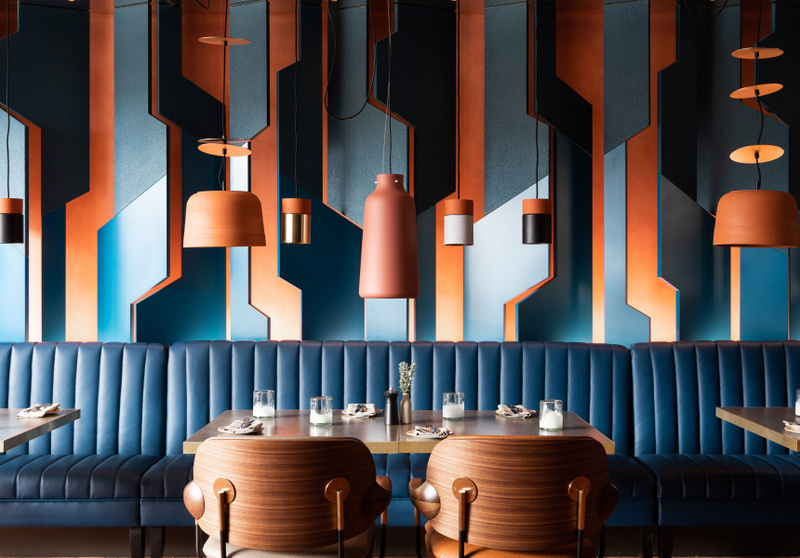 The QT Melbourne and its bold use of colour, pattern and texture evokes the Italian rationalist masters of the 1930s who focused on glamour and modernity. We have had the brand hotel, the boutique hotel, the art hotel, the generic airport hotel… is there a next direction for hotel design? I am no prophet, but we have recently been pitching on two huge projects in India and Singapore. Those 5-star projects are looking at larger public spaces and smaller hotel rooms with a high level of finish. They want to give people an authentic experience because they are now competing with Airbnb. What does that mean for design? It means we are putting more effort into a less cookie-cutter approach by designing a variety of different room types and looking at how we can manipulate space. All the theories that have existed for 25 years, including open bathrooms versus closed ones. Each and every project presents a different series of issues and objectives, but trend-wise it’s about an authentic engagement on a design level. When you say authentic, what is your take on that? I think using locally inspired materials, it’s never going to be possible for us to use all local materials in Australia because so many of them are imported. The cost of construction also forbids that to happen. If it is vintage, there is something that’s recognisable from mid-century Australian design. There could be artwork, an object or paraphernalia. For the W Hotel in Brisbane, we bought a couple of hundred Australiana tea towels that you see at airports, with maps of Australia, kangaroos, didgeridoos and boomerangs, and sent them to our printer who overprinted them in gold and silver. They were authentic and yet all of a sudden we turned them into something chic. Humour seems to play out as an important foil to your historical narrative. At QT Sydney there was a consultant engaged to instal a censor in the lift so that when you are in there on your own, Elvis Presley’s 'Are You Lonesome Tonight' plays, and for more than eight people party anthems come on. Interaction is important. Digital art is good because it keeps people’s attention and you can also change it. We always try to give those sight lines a slow reveal and a sense of discovery. It doesn’t have to be Disneyland,, it can be done in a very beautiful and stylish manner. 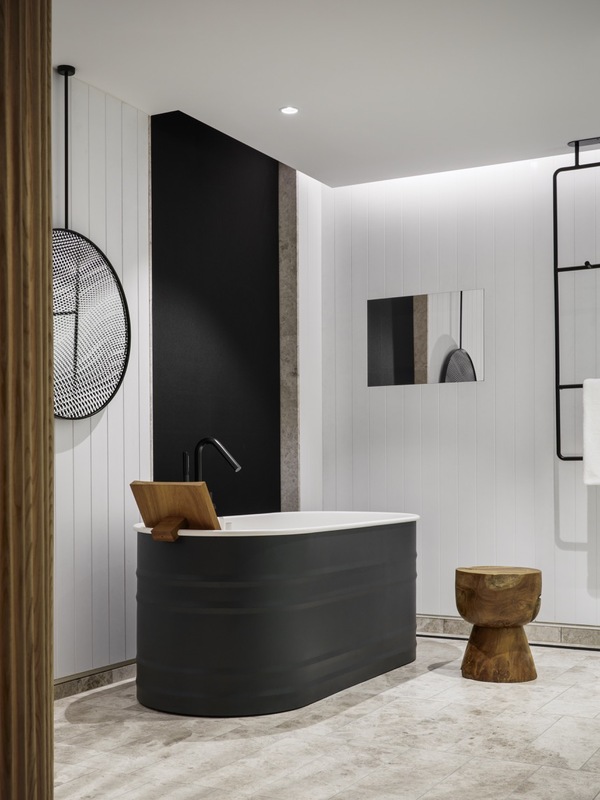 The W Hotel Brisbane layers materials and colour, creating interesting and unexpected spaces within each hotel suite, including the circular timber wardrobes and open plan bathing areas. Photography Justin Alexander. 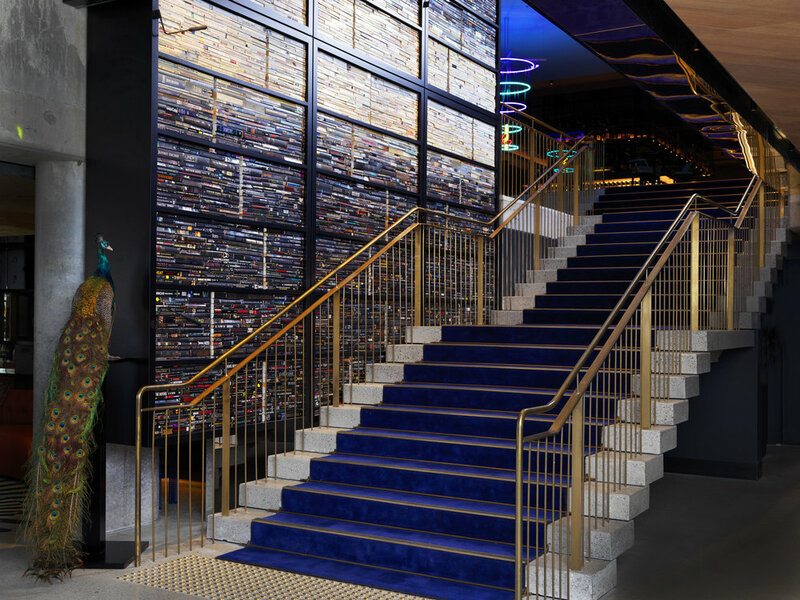 At the QT in Melbourne we created a huge bookcase wall beside a glamorous staircase. From day one I had always imagined bringing back the idea of the staircase and that fabulous people-watching moment, so that idea became a very strong part of the design narrative. Adjacent to that I wanted to have a humungous wall of books and have an artist paint onto the books like a canvas. There are around 8,800 books and all of the stories are based on love, so not only did the artists we engaged have to find all of those paperback and hardback love stories, they had to colour-code them to create the illusion that the wall is illuminated with a spotlight. For me those things are important. One we are recycling, in this case books. We source all sorts of accessories from junk and vintage shops so we are into reuse. Secondly it adds humour and starts to pose some questions for people. When you get to the top of those stairs, there is a wall of silver trays, the ones that Nanna saved for serving sherry at Christmas. We stuck them on the wall like mirrors and they became a talking point because people can read all of the different inscriptions. How does your process of research unfold? For every project we start with a narrative and the narrative is usually broken down into five words and that becomes the core statement about what a particular property is about, and how it has been influenced. For the W Hotels for example, that usually takes two or three months and you have a very in-depth look at the history and culture, fashion, music, art, design, food, all of those things go into a document. It then has to be approved by the heads in New York and locally in Asia. When it comes back we refine that down into three pages with a clear narrative stream, and a few key statements to reflect upon in the hotel. We also try to tap into art as much as possible to give us visual cues on how to decorate a space. I don’t mind using that word because sometimes that’s what we do, we are given a shell and our job is to decorate and enhance. We still look at minimalist works, we study theatrical lighting techniques, visual arts, contemporary as well as historic, we use graphic design a lot. We won’t put in big walls of marble but we will put in big walls of customised wallpaper, wrapping walls and ceilings and toilet cubicles. Tell me about the 10%s, those favourite moments of each job. When they ring and say you’ve got the job! (laughter) There is nothing more lovely than rolling out the yellow trace paper and a handful of pens and scribbling away. Then 2 years later, and sometimes 5 or 6 years for some of our projects in Asia, you look back at that time and see how much a project has changed. We are very pragmatic about that and sometimes it brings the best solution. At QT Perth we had a large bar off the restaurant and we had to cut a substantial amount from the budget so we deleted all of our design and decided to line all the walls in wallpaper and mirror. As it turns out, it is the most popular venue in the hotel. What does a day in the life of Nicholas Graham & Associates look like? A typical day for me is first exercise, then a good coffee. I try not to turn on the email immediately and have the first couple of hours of the day to resolve design issues with the team before getting stuck into the email, because that can chew up hours at a time. The travel we are doing at the moment is Singapore, China, Taipei and Hong Kong, I was just in Manila, we have finished QT Perth, we are designing QT in Auckland and will soon start QT Adelaide. 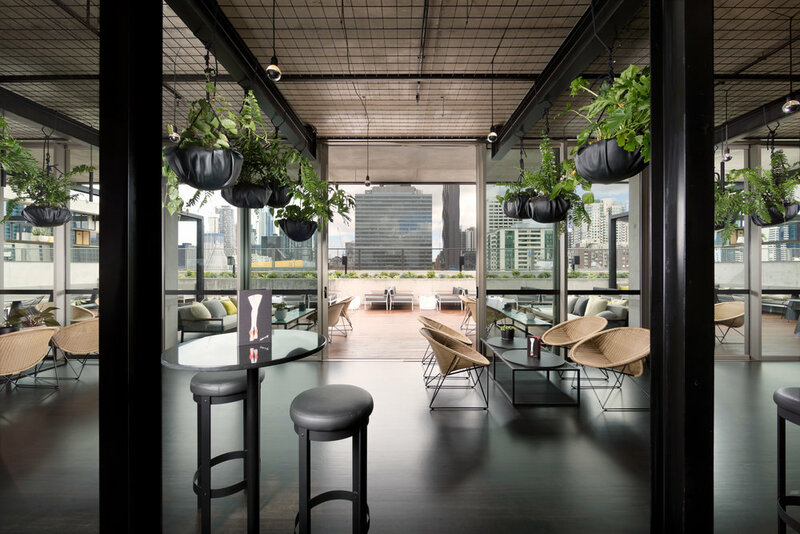 The QT Melbourne with its city views mirrored and transformed with light and plants on the rooftop of the hotel. The floor to ceiling bookcase at the QT Melbourne includes more than 8,800 colour coded books about love that were sourced and installed by two local artists. Working in different countries, how do you approach the cultural nuances of each place? Detailed collaborations with artists, craftspeople and designers including Fabio Ongarato have created some of the very unique spatial experience at the W Brisbane, including a huge in situ graffiti wall that became one of the most talked about additions to the new hotel.. Photography Justin Alexander. Some of our Chinese clients like the fact that we have cultural sensitivity but can look at it from the western side. We are not local so we don’t stick to the rules. In Singapore they were interested in us because we are small and design-focused, and we are flexible and enjoy workshopping things. Design for me is a collaborative process and part of that in Asia is holding their hand during that process. They do need to be given comfort that some of the risks you are taking will work. At the W Hotel in Brisbane, we were trying to convince the client that a ridiculous circular wardrobe was going to be cool because no one had done it before. They trusted in what we were doing and are now very happy. Sometimes there are feng shui aspects that we have to consider which I find fascinating. Most of the time it has to do with budget and the perception of quality. Tell me about the craftspeople who help to shape your projects, are there some key people? We designed a beautiful collection of rugs for the W Hotel in Brisbane. They were very intricate, opalescent, inspired by Aboriginal dot painting, opals, rainforest, and the tracking of the river through landscape. They were very detailed so I had to go to the factory in Thailand to select every colour, of which there were 78 over the collection of 68 rugs, and some of the sizes we were working with were the size of your fingernail. Seeing the huge rugs being made with a tufting machine, which is like a handgun, and the Thai girls happily working away on very intricate design work. It was extraordinary and a really nice collaboration because they really liked what we were doing. We also engaged local artists to do a series of in-situ works, so instead of buying canvases we handed over whole walls. That was a really great collaboration. A week before the opening we had about 300 staff coming in and out to do training while the artists were working on the huge works. One was a graffiti wall and to see him working day and night to produce this amazing artwork, with all the hotel staff having a conversation with him about it, was really nice on all sorts of levels. The staff engaged with what we were doing and they really understood the narrative. The lobby area of the recently opened QT Perth is a mix of bespoke furniture pieces, the newly released Caristo Armchairs by SP01, and careful theatrics that expand the space through mirror and large artworks. It reminds me of the project the Campana Brothers did in Athens, where they engaged architecture graduates from the National Technical University to make the interiors from found materials on site. Years ago that’s how it would have been done. As a community you would be building the churches and buildings together, and there would always be someone with the story and some sort of contribution to make. We just don’t see that anymore, everything is done behind closed doors and delivered on a truck. So to see something that is done in-situ is actually quite rare. I don’t have a single answer. My Chinese clients are still about the bling, the polish and it’s definitely not about less is more – they want more. You also have perceived luxury which is smoke and mirrors and raises the issue of whether, for example, something is real brass or imitation. We are living in an age where you can make anything look like anything, which can be amazing in terms of the sorts of facilities we have to produce things, but it can also be very tiresome. I think luxury used to be about space and it’s not really about that anymore. For me it is about putting more into an interior – designing spaces which are engaging, making sure that you have a space for a toilet bag beside the basin, making sure that when you brush your teeth the toothpaste doesn’t go all over the glass, and making sure there is enough space in the room for your bag. They are simple things which are practical and pragmatic but are too often not thought about. The Santini Bar at QT Perth called for a creative response to a reduction in budget and is now the hotel’s most popular venue. Maybe luxury is also stripping everything back to the simplest experience, the basics can be refreshing. Absolutely, sometimes luxury is about the experience and not what is tangible. It’s funny when I take holidays I don’t like to stay in a 5-Star hotel. I prefer to stay somewhere off the beaten track. Last Christmas I went to the Philippines and stayed in a shack with a mosquito net and no internet. I recommend it. Creatives are intrinsically curious, what are you most curious about right now? Colour is something that has always fascinated me. People are using colour again like the 1970s, strong colour, mixed patterns and shapes. For me the most interesting stuff is experimental, sculpting things with light and shape and form. 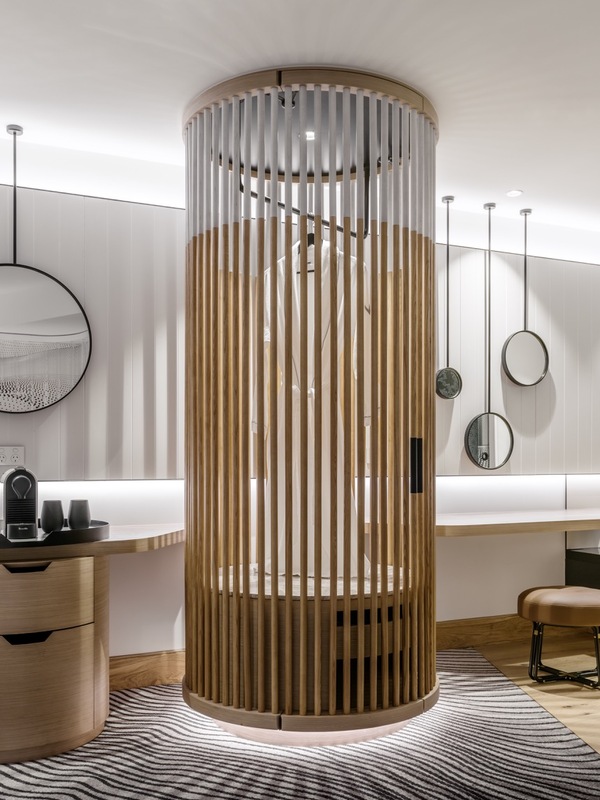 With hotel design it doesn’t always matter if it’s on point and fashion, clients are now embracing the fact that people want something different. Given an open brief and an open client, can you describe the hotel you would love to design? It would probably be a small hotel. I have designed a couple of residential projects before with seven bedrooms and an enormous kitchen and entertaining space, and I love the idea that people are drawn to where the food is produced. Food is an important part of life and restaurant design is a joy, so to design a hotel around a restaurant offering would be exciting. I am not drawn to the city, or the coast, it could be anywhere, but I think the idea of a kitchen and something that is always on the go with great smells and coffee. That for me is luxury, that and a comfortable bed. I just got a vision of a long table for 20 people and everyone coming together to share a meal. Maybe that’s because I sit alone a lot in restaurants when I’m travelling. I think Europeans and Asians have got it right in terms of their sense of meal time and bringing family and friends together. It’s something we do here in the office, we all eat lunch around one big table otherwise we wouldn’t have that time with one another. Finally, what lessons have you learnt running your own practice? I have a saying that flexibility is the key to immortality. At the end of the day sometimes the best results come out of a challenge. So remaining flexible in the work we do is something that I have to live by. But it is something that is hard to teach! Thank you Nic, great chatting with you.